Can I Give My Ferret Pepto Bismol? | Can i Give My Ferret? Can I Give My Ferret Pepto Bismol? Can you give your ferret pepto bismol for indigestion problems? When you observe usual playful ferret to be lacking in energy, has no appetite and has dull or glassy eyes, these can only mean that there is something wrong with it. Because of its many endearing qualities, it’s easy to connect with a ferret. So, it is normal to feel worried and sad or panic when a pet as lovable as a ferret seem to be not feeling well. Properly information about common ferret diseases and how to take care of a sick ferret will help become a better pet owner. Ferrets are very delicate animals. They have small, short and sensitive digestive track which make them highly susceptible to diarrhea, indigestion and gastric ulcer. These conditions will make your ferret suffer stomach pain, loose bowel movement, vomiting and fever. Indigestion, on the other hand, can also show signs of stomach upset and teeth grinding while gastric ulcer is accompanied by abdominal pain, vomiting with blood, weakness, loss of appetite and weight loss. Diarrhea and indigestion are usually caused by a number of reasons: stress, intestinal blockage, food poisoning, improper diet, and mal-absorption. Gastric ulcer is an infection with the bacteria Helicobacter mustelae which could be from overgrowth of some tissue and cells in the stomach, overuse of medications, stress, poisoning and possibly serious neurological diseases. If these symptoms occur occasionally, then it is just normal; but if it happens frequently, it may be a symptom or manifestation of a more serious disorder and requires the attention of a veterinarian. 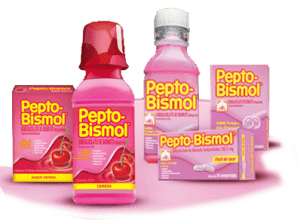 Pepto Bismol is a popular over-the-counter drug that is taken to treat minor stomach upsets like indigestion, diarrhea, heartburn and gastrointestinal tract discomfort. The active ingredient in Pepto Bismol is bismuth subsalicylate. It works by killing bacteria that caused the condition and decreasing inflammation and irritation of stomach and gastrointestinal lining. When you see your ferret suffering, you want it to end as soon as possible. Because sometimes going to the veterinarian is not the fastest option available, most ferret owners resort to self-medication. Since human medications also work for ferrets, most use Pepto Bismol whenever their pets are suffering from stomach pain. And there has been a great deal of success in treating minor stomach conditions with Pepto Bismol. And usually Pepto Bismol is prescribed by veterinarians themselves. The tablet is usually crushed and mixed in food so the ferret can tolerate its taste. Taking Pepto Bismol is not without some side effects. Your ferret may experience darkening of the stools or the tongue, bleeding from the stomach or intestine, persistent vomiting, continuous diarrhea, dizziness, dehydration, stomach or abdominal pain and some trouble breathing. These maybe because of some allergic reaction to the contents of the medication or overdosage. It is worth noting that Pepto Bismol overdose can likely happen especially when self-medicating. But every illness is different from the other just like your ferret is different from your friend’s. Before any kind of medication, it is still best to seek the advice of the expert to know what illness your ferret is suffering from. At the clinic, the veterinarian can fully examine your ferret and work out a plan to treat it. As you know now, indigestion, diarrhea and gastric ulcer share the same kind of symptoms like stomach pain and vomiting but there are different ways of treating each condition, which is why it is still wise to consult some who knows best, the veterinarian. As a ferret owner, you need to keep calm, trust your veterinarian and make the ferret as comfortable as possible while it is sick. Continue taking care of him by first and foremost making him relaxed and warm. Put him in a separate place from the other pets to avoid spreading the infection in case it is a viral infection. Stomach upsets deplete the body of fluid and food intake so keep the ferret hydrated by giving lots of water. Sick ferrets are difficult to feed but still they need to take something so give them soft and easy to digest food. Assist a ferret in eating even if it means hand feeding it. Do it until it has regained its strength and be capable of doing it on its own. To increase a ferret’s appetite, try mixing canned ferret food with baby food. Don’t forget to support these preparations with vitamins and supplements. Remember that sick ferrets need extra tender loving care and attention for them to easily recover. Thanks much! I’ll be giving my baby some tonight, she seems to have a belly ache.